Barney has a new look to his old pad in this direct-to-video release. Using Barney's favorite tool--imagination--we find that his house has many surprises, including rooms filled with bubbles, butterflies, and beach balls. This 45-minute tape is song-filled as kids meet up with Barney's pals BJ and Baby Bop to discover lots of things, from making sour pickle faces to the wonders of pumpernickel bread. Although this production is not as episodic as the popular TV show, Barney has hardly changed in a dozen years, and in some ways has been passed by other educational shows. When BJ starts a band, nothing is taught about music or instruments as a Blues Clues episode might teach. And the humor seems old, even when Barney tries to be up to date. When Barney talks about a computer, it's with a surfboard-carrying mouse (computer mouse, get it?) named Murray who sings about "surfin' on the World Wide Web" without explaining anything about the Internet. Still, for youngsters who like the appealing and colorful world, there is more here than the average show from the purple dinosaur. 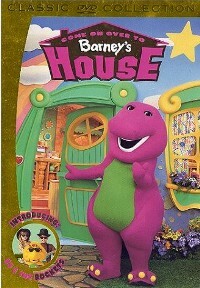 Barney speaks to kids directly, and makes them part of his happy housewarming adventure! Where, Oh, Where, Has My Little Dog Gone?